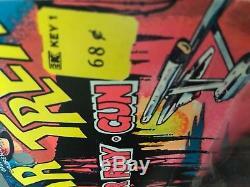 This is a vintage KRESGE CARDED 1976 Mini Star Trek Phaser Ray Gun produced by AHI Toys! Phaser comes mint on card (MOC) with the bubble firmly attached to the card! As you can see in pic 2 the Kresge price tag is actually PRINTED on the card (NOT a price sticker) and the Kresge logo is printed on the bottom of the card (as seen in pic 3). A very rare piece of Star Trek memorabilia! 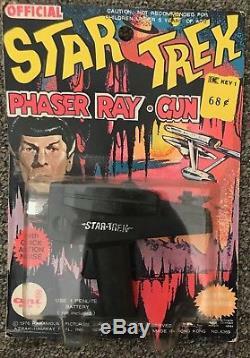 The item "VINTAGE 1976 KRESGE CARDED AHI STAR TREK PHASER RAY GUN MOC" is in sale since Tuesday, August 14, 2018. This item is in the category "Toys & Hobbies\Robots, Monsters & Space Toys\Space Toys\1970-Now".